Square today is formally launching Square Cash, a product that allows anyone to send money to a contact via email. Square initially soft-launched the product to a limited number of users earlier this year but is opening the service more broadly to users with a few tweaks to the initial payments system. As Square’s director of products Brian Grassadonia explains, this launch aligns with the company’s goal of reducing friction around payments and making commerce simpler. Whereas Square’s core products, including its iPad register and swiper, make payments easy for merchants, this makes sending cash to anyone as simple as sending an email. Here’s how it works. The sender simply emails the person they want to send the money to with the amount of money either in the subject or body of the email and CC’s cash@square.com. If the sender has not already added his or her debit card, then Square will instruct the sender to register a debit card on a web page with just the card number, billing ZIP code and the expiration date. The recipient will immediately get another email from Square telling them that they have received money from the sender with a link to add the recipient’s debit card, billing ZIP and expiration date. Once they type in their debit card information, this begins the transfer, which takes one to two business days. We’re told that the recipient has up to 14 days to enter the debit card and receive the money, and the recipient will get reminders every other day via email. Square is also releasing native apps for Android and iOS that incorporate email, as well. When you open the Square Cash app on your phone, you’ll be prompted with a number pad, in which you type in the amount of money you want to send. Once you do this, the app will bring up an email from the dedicated email client on the phone. The email will be pre-filled with the amount the sender entered, and they can type anything in the body of the email, as well as input the email of the person they want to send money to. The user experience from then onwards is similar to how you receive/send payments via a traditional email client on the web. The app, Grassadonia adds, are for users who want to keep Square Cash at top of mind. “We want this to be an extension of your offline world, so that no matter where you are, you can send money to anyone,” Grassadonia says. As for fees, Square says there aren’t any associated with Square Cash. This actually is a change from the initial version of the service, which charged senders $0.50 per transaction. There are, of course, a number of competitors in the space. First, Venmo offers a similar peer-to-peer payments system that allows you to pay your contacts and Facebook friends from within apps. Google is also rolling out Gmail integration with Google Wallet that would essentially allow users to perform the same functions as Square Cash. But Grassadonia says that Square Cash differs from some of the other offerings out there because you don’t have to be an account holder, and the service only requires you to enter your debit card number. 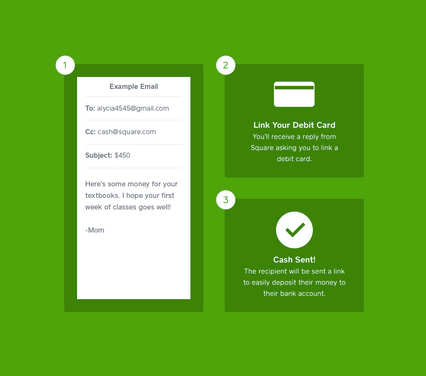 In addition, Square Cash is email-client-agnostic so you can send from any email client. As for whether Square will add the ability for integration with Facebook, we’re told that there are no plans for social integrations as the company wants to keep Square Cash lightweight. It’s not surprising that Square is betting on P2P payments with Square Cash. There are a considerable amount of opportunities to incorporate P2P payments into apps and scale across a number of markets. We heard that Venmo, which was just acquired by PayPal via the payments giant purchase of the Braintree for $800 million, was particularly attractive for eBay and PayPal. And PayPal CEO David Marcus seems to be investing in Venmo to build out the service to a global platform.